Cape Town (and South Africa) is proudly represented at the 2018 P750 World Championship held in the city of Féjus Var on the south French Riviera in France. 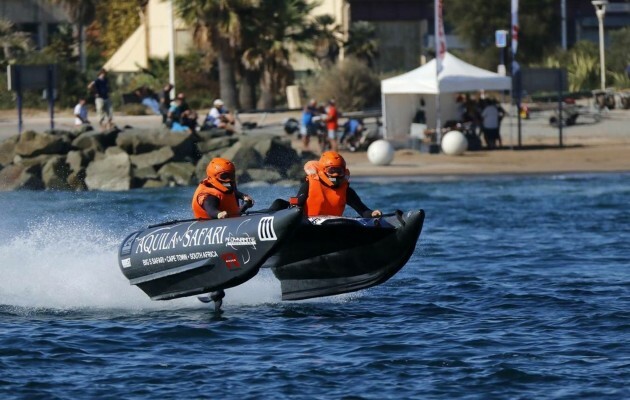 The international inflatable boat race started 28 September and will run until 7 October 2018. The international inflatable boat race bring countries together across the globe, representing South Africa, France, Germany, Great Britain, Norway, Netherlands, Iceland and Sweden in two categories: Modified and Pro-stock. M-SHAPE: a short course of 200m x 300m where boats can be seen to fly up to 6m in the air. CIRCUIT: where speed begins; this is a larger course of 500m x 500m for achieving the maximum speed the tunnel hull can provide (up to 110 kpm). ENDURO: This category separates the men from the mice; generally over a distance of 100+ km. Teams are sent off down the coast to specific locations, beach the boat and run around a checkpoint. A Springbok Pro-stock team is sponsored by two Cape Town Big 5 game reserves: Aquila Private Game Reserve and Spa, together with Inverdoorn Private Game Reserve, and represented by international champs Tony Ingram and Stefan Lindeque. The team is flying the South African Springbok flag high with magnificent results on day one of the international race. The Aquila Safari team polled second in the pre-race qualifier and won the first day of racing - putting them solidly in the lead. Unfortunately day two of the race was cancelled due to bad weather. With the awards ceremony planned for Sunday 7 October, fans and followers can follow all results on the official website of the event: https://www.p750worldchampionship.com. Updates will also be made on the @aquilasafaris and @inverdoorn Twitter timelines.